Which Are The Best Horse Ice Boots On The Market? If your horse’s legs swell after exercise or if they have arthritic joints, an ice boot can help relieve the pain. Ice boots for horses are used as cold therapy to heal any leg injuries that your horse may get. Ice boots are great when it comes to inflammation in the legs of your horse or even to just you’re your horse’s legs after a hectic workout. That is why it is best to keep an ice boot handy for your horse. The Ice Boot from Professionals Choice has a neoprene exterior. This insulates the gel pockets inside the boot so that the boots are cold for a longer period of time. This increases the therapy time for your horse. The ice boot has a nylon lining which is very smooth. This reduces the potential to damage the tissue of your horse’s skin that is exposed directly to the ice. It also prevents the shavings, dirt and other types of the debris from entering or sticking to the ice boots. The ice boots have hook straps that are extended. This allows you to help your horse wear it easily. The packing of the ice boots is convenient and is as a set of two. You also get a mesh bag to carry the boots. You can activate the ice boots by placing it in a freezer until it is frozen. Then if you need to use it far away from the freezer, keep it in an ice chest until you reach your horse. Excellent insulation: The Professionals Choice ice boots has an exterior made of neoprene. This ensures that the gel pockets that are in the boots are well insulated. Gentle for your horse’s skin: The ice boots have nylon lining. This makes it very gentle on the tissue that is below the skin of your horse. The lining also stops dirt from sticking or entering into the boot. Easy to use: The Professionals Choice can be used easily as it has extendable hook straps that make it easy to put it on your horse. It also can be used on both the hind and front legs of your horse. Money back guarantees: The ice boot comes with a 30-day money back guarantee. It also has a six-month warranty. Warm and cold spots: Some reviewers online mentioned that there were warm and cold spots and the ice packs did not have uniform cooling. The Professionals Choice is the best professional ice boots in the market today. 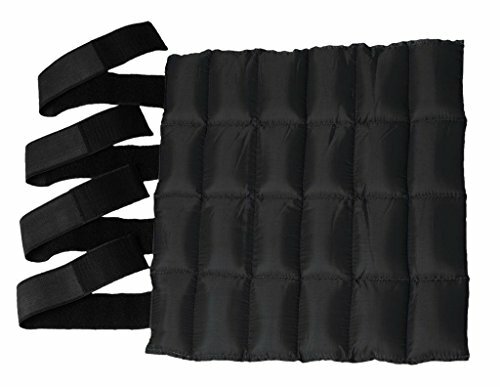 It has great insulation; it is easy to put on your horse and has a money back guarantee if you are not satisfied with it. Make sure that you keep it cool until it reaches your horse. The Tough 1 Ice Boot has a heavy nylon shell which makes it very strong and durable. It is a very cost-effective ice boot and stays cold for a very long time. It has four Velcro straps which allow you to adjust the boot so that you can compress your horse’s leg as per your wish. It also makes it easy to put on to your horse. The ice remains soft even when frozen so it conforms well to your horse’s leg. Long lasting: The best thing about the Tough 1 Ice Boot is that it is long-lasting. Many reviewers online have used it for years and still don’t have any complaints about it. It is very durable. Long cooling: The cooling of the Tough 1 Ice Boot last for a long time. You can keep it in your freezer overnight and then strap it to your horse. It will easily stay cool for a couple of hours giving your horse a lot of relief. Easy to use: The ice boot has 4 straps of Velcro. 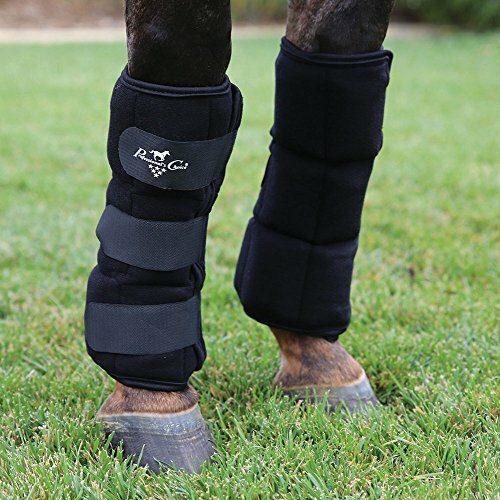 This allows you to put compression as per the requirement to your horse’s leg. It also stays soft when it is frozen. This helps it to conform to the leg of your horse making it more effective. 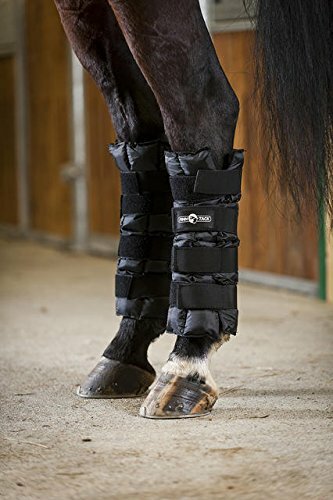 Great for treating arthritic joints: If you are looking for an ice boot for your horse if it has arthritic joints then, the Tough 1 Ice Boot is a great option. You can also check our article on best horse supplements for joints. Price: When you compare the quality and the cooling ability of the ice boots to the price, this is an excellent deal. Single Boot: You get only one boot so if you need it for more than one leg of your horse, you need to buy multiple boots. This adds to the cost. The Tough 1 Ice Boot is a great budget ice boot. It is long lasting and durable. It cools well and the cooling lasts for a long time. It is very easy to use. The Finn-Tack Cooling Horse Leg Wraps are cooling Wraps that are used to cool your horse’s legs after exercise. It helps in decreasing the swelling that may come due to the exercise. Great for cooling: The Finn-Track wraps are great for cooling your horse’s legs after they work out. It is great for reducing swelling too. The cooling is long lasting so you don’t need to go back and forth to the freezer to cool it. Easy to use: The wraps come with four Velcro attachments. This makes it easy to put on your horse’s leg and also easy to fit it well so that the cooling is effective. Non-uniform cooling: The Finn-Track wraps have many square gel packs instead of one uniform cooling substance. This causes warm and cool spots in the wraps. The Finn-Tack Leg Wraps are perfect if you want to reduce swelling that your horse’s legs may get after exercise. They are reasonably priced and come in pairs. The four elastic straps on the wraps which have Velcro attachments make it easy to use. Ice boots have many benefits for your horse’s legs and overall health. As you have seen above, the best ice boot for horses in the market today is the Professionals Choice Ice Boot with its ease of use and excellent insulation. If you are looking for a budget ice boot which does the job, you can go for the Tough 1 Ice Boot. Finally, if you want wraps for your horse’s leg to cool it after exercise then the Finn-Tack Cooling Horse Leg Wraps is the one for you. Oh, at first I was thinking ICE like, ice on the ground 🙂 This makes more sense now that I see the different options available for horses. I would imagine that if you are training your horse at all, these would be good therapy.